Simmering to the surface slowly but surely within the world of Indian dance, is a full-fledged battle between classical dance and contemporary dance. With eyes and ears open, wherever I go, I observe walls being erected, not demolished. This dichotomy strives only to destroy the future of dance and dancers in India because it further divides an already fragmented community, and creates unnecessary disunity and distrust, making any hope for a supportive and generous community of dancers, less of a reality. Time and again, classical dancers in Delhi have questioned the need for Indian contemporary dance. The argument is poor – We have so much in our traditions, why do we need contemporary dance? It is akin to saying – we have such wonderful black-and-white films, why do we need film in colour? But surprisingly, I find many contemporary dancers being equally closed-minded about classical dance, turning their noses up at the many years of training and hard work that classical dancers go through. I find both viewpoints equally ignorant, ill-informed and prejudiced. I also find the rate at which the dichotomy is getting consolidated highly alarming. I am trained primarily in Bharatanatyam. But having trained in other forms, and having researched a little on dance, as I came to question several things about dance and the systems in place within dance, I found myself more grounded because I was more aware. But I also felt lost, especially as I became increasingly aware that people believed in this dichotomy between classical and contemporary – Where did I fit in? Was I classical? Was I contemporary? Why couldn’t I be both, or neither? A lonely place to be, I found myself perhaps too classical for contemporary dance and too contemporary for classical dance in India. Upon realizing that I possibly lived and danced in this limbo-like space, it became imperative for me to examine and understand how important, necessary and justified this dichotomy between classical and contemporary really is. What I found was that this dichotomy is easily demolished, and should be. I attempted to answer two questions I set for myself in the quest to demolish dichotomy – One, what makes something classical or contemporary? And two, if they are indeed not quite so dichotomous (a hypothesis I attempt to prove in the course of this article), then why does this binary exist so rigidly? Classical implies several things – when we speak of the classics, we often refer to the ‘ancient’, and traditional. We also associate it with religion in India. Classical art is also often seen as quite literal. Ballet is often prefixed with the term ‘classical’, and Bharatanatyam is considered a classical Indian dance form. Then, what about contemporary dance? As was pointed out to me by a well-known choreographer recently, contemporary dance does not have a permanent code. Arguably, it has several definitions and forms, but the possible common threads that run through it include going beyond the classical and traditional, and creating something modern and not ancient. It can also be defined as abstract and not literal. In India, there has been a move away from the ‘classical’ for many years now, as dancers through the years have explored different methods, intentions and directions for Indian dance. Having examined the possible explanations of classical and contemporary, the dichotomy between the classical and contemporary may seem obvious at first, and even justified – the former is ancient, the latter is not. One is literal, the other abstract. One is a reaffirmation of traditional values, the other is a breaking away from them. The former has religious affiliations, the latter occupies a more ‘secular’ space. But upon deeper analysis, it becomes clear that the lines separating the two are not clear and sharp, but really quite blurry. Bharatanatyam has a complex and contested history, but is arguably classical and contemporary at once. The myth that Bharatanatyam is an ancient traditional dance form has been shattered by many scholars before I did so in my master’s thesis earlier this year. It is not an uncontested claim. But going by the rough definition of ‘classical’ in the above paragraph, Bharatanatyam does of course have elements of the classical in it. It does involve spirituality and devotion – and in some senses – that is partly the religious aspect of Bharatanatyam. It also draws its roots from an ancient dance form, performed by Devadasis in temples. I would argue that that itself makes Bharatanatyam a contemporary form too. 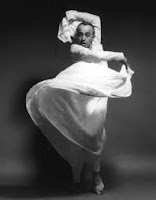 It drew from – but in many ways also departed from the ancient and traditional dance form that was called ‘Sadir’. It broke away from it spatially in its move from the temple to the proscenium stage, in terms of content from ‘sensual’ (sringara) to ‘spiritual’ (bhakti), and also in terms of class and gender – traditionally performed by lower caste women taught by lower caste men (nattuvanars), now it is performed primarily by upper caste/class men and women. As far as the abstract and literal is concerned, Bharatanatyam is capable of both. Some dancers perform it very literally, word for word according to what the poetry says, while others have found abstractions by reading between the lines in the ancient poetry. In my own modest way, I attempted to portray social evils like untouchability and the prohibition on Dalits to enter temples through 14th century texts in a padam. My last performance was also a shift in focus from the divine aspect to the human aspect of Bharatanatyam, a contemporary departure from the comparatively traditional emphasis on god. So how could I label Bharatanatyam as classical and only classical, when I found so many elements of the contemporary in it? I find the dichotomy between classical and contemporary demolishing even upon examining Indian contemporary dance. Chandralekha’s work is an obvious example. 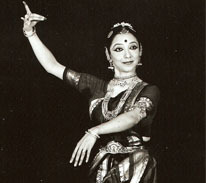 Her choreography utilized Indian traditional art forms, yet the content of the work was very contemporary. She moved away from the religious narrative, while simultaneously going back to tradition. Other Indian contemporary dancers, whose work I was able to see at the Gati Ignite! Festival of Contemporary dance, also seemed to constantly indicate that this dichotomy is unnecessary. 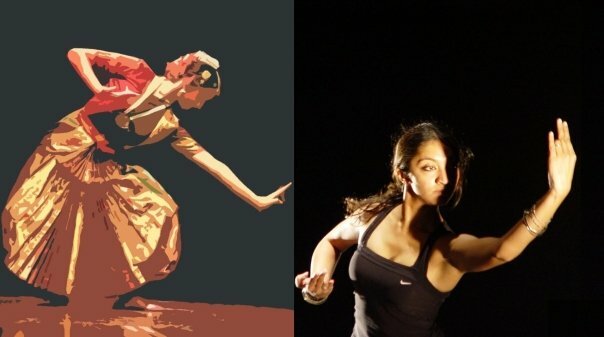 The Indian contemporary dancers showcasing their work either launched into contemporary dance from a classical dance background, or were rooted in modern and contemporary dance but were moving towards exploring classical dance forms. Either way, the blend between classical Indian dance and Indian contemporary dance was utterly obvious. I found the above inferences and observations so obvious upon analysis, that it is possible to say that the dichotomy dissolves, at least in theory. However, my argument that the two are fluid should not be mistaken with a claim that there is no difference between classical Indian dance and Indian contemporary dance. While I do insist that they should co-exist, and even derive content from each other, I admit that the difference must be recognized. My next question then is this – should difference necessarily symbolize incompatibility? The logical answer to that question is – No. The difference between classical and contemporary dance certainly should not symbolize their incompatibility with one another. It must not signify a corrosive co-existence. Unfortunately in India, I find that despite the fact that this dichotomy between classical and contemporary is clearly ‘demolishable’, it not only exists but breeds incompatibility and constructs borders of caustic barbed wire between the two forms. It is for that reason that I set myself the second question – why is this binary so rigid? Perhaps for some dancers, the dichotomy, it’s potential to be demolished, and simultaneously, its pervasive rigidity is a non-issue. I have experienced dancers reacting to my questions about this unnecessarily rigid dichotomy with utmost impatience and dismissal. But that this dichotomy is made to exist so strongly is undeniable. To my mind, there are several reasons for this and they are all inter-connected. The first is obvious – there is simply a lack of awareness about the other’s dance. A classical dancer who says contemporary dance has no technique or discipline, or a contemporary dancer who says that classical dance has only technique and discipline are simply blissfully ignorant about the other form. Any dancer who opens his or her mind to another dance form would realize that there is much to learn from it that perhaps their own dance form could not transmit in the same way. And by learning, I don’t mean that a contemporary dancer should attend a few weeks of beginner’s Bharatanatyam or that a classical dancer stumbles into an improvisation class. What is needed is not a premature hasty judgment, but a deep understanding of the dance form that you don’t call your own before you start to judge it and its dancers. I think that the acceptance that this binary is a reality we can do nothing about becomes an excuse to not do this hard work. It is easier to criticize than to attempt to understand. Thus, my first point is that despite the blurred boundaries, it is ignorance that makes the dichotomy rigid. Secondly, I think the existence of the binary veils closed-mindedness amongst dancers in India. Particularly in a system where the Guru-shishya relationship becomes more than just a teacher-student relationship, the closed-mindedness of a dance teacher can be easily transmitted and even imposed on the students of dance. It is not uncommon to hear that teachers discourage students from learning other dance forms. Some Gurus imply dire consequences for a shishya who shows interest in contemporary dance while some contemporary dance teachers want students to ‘shed’ the classical background before entering their classrooms. This is not to say that all gurus and teachers are like that. Of course not. But one does catch wind of these occurrences rather frequently. So, closed-mindedness is the second factor that turns this fluid relationship between classical and contemporary dance into a rigid dichotomy. Moreover, the lack of platforms to perform in India contributes to the rigidity of this dichotomy. Dancers and patrons of dance have several different viewpoints on this. I illustrate this point by relating a discussion between myself, a senior dancer, a dance critic and a cultural organizer a few months ago. The senior dancer claimed that there are more platforms to perform now, than there were when she was a young struggling dancer and argued that young dancers today are just not patient or disciplined enough to wait fifteen or twenty years for the platforms to be available to them. The dance critic argued that while it may be true that there are more platforms than before, there are also many more dancers today than there were in the previous generation, so the competition for space is that much more - the situation is not necessarily better and could be worse. The cultural organizer, in turn, stated that it is not true that more platforms exist for young dancers today, and argued that senior dancers and young dancers are vying for the same few platforms to perform, and that young dancers suffer as a result. My interjection came in the form of disagreement with the statement that all young dancers are impatient and lack discipline. Whatever the reality, it was obvious that talking about platforms for dancers did not make for smooth and comfortable discussion. Here, all the players in the debate belonged to the classical world of dance. Bring contemporary dancers into the debate and the competition for space arguably becomes even tighter. Where classical dancers had fought amongst themselves for platforms to perform, with the prominence of contemporary dance in India, now the two could turn on each other and not just fight amongst themselves. Thus, the lack of platforms becomes another reason for the consolidation of this dichotomy between the classical and contemporary in India. To sum up – I argue that the acceptance of this dichotomy promotes the idea of competition and opposition amongst the two forms. In turn, the closed-mindedness and lack of awareness and understanding justifies the existence of this dichotomy. The dichotomy and the dancers are caught up in a vicious circle. 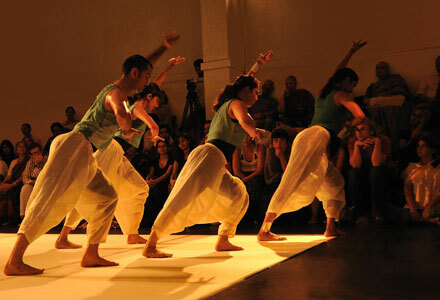 Having established that this dichotomy is unnecessary because the classical and contemporary in India flow into one another and draw content from each other, this article attempts to demolish, and certainly questions the idea of a pre-existing classical-contemporary dichotomy that invades the minds of many dancers, teachers, critics and spectators and highlights some of the real possible reasons – in other words, the problems of ignorance, narrow-mindedness and sharing space – for why the dichotomy appears to persist despite its obvious irrelevance in the Indian world of dance. The apparent dichotomy between the traditional and the contemporary firstly, arises when you begin to hold the belief that has been historically imposed- contemporary dance is breaking away from traditional. What I don't understand is, why do artists make the debate external. The dichotomy is within. This connects to all the dualisms we have ever looked at, man-god, mind-body, black-white, yin-yang. What if, it was all about finding your voice? a naked voice. To yourself, to God, to the cosmos, to your society. If at all, people downsize it to fit it into a box.. that shouldn't matter. We appreciate the Madhubani, the child's sketch and the animation. What has to be noticed is that all that goes up in front of our eyes is a matter of perception. How is it that we have learned to appreciate aesthetics. How does popularity contribute to it? How does repetition contribute to it? What is the emotional audience? 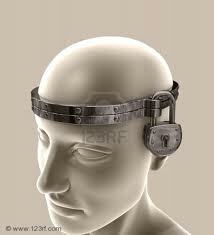 We can all be teens in our heads.. whether traditional, contemporary, critic or audience. We can all ridicule without really giving ourselves to understanding. We can watch traditional dance and call it "aunty types, dance armies", we can watch contemporary and call it "crazy-mad, navel gazing", we can read the critic and say "too academic, narrow-minded" and we can look at the audience and say "uneducated, unable to comprehend finesse, closed to newness"
but all of this dissolves when a sort of sacred love surrounds your practice. A naked way of connecting to something within you and around you. Something which you can call practice, that has something intrinsic about it- that you- the dancer, the human enjoys. Only this seed of enjoyment, rasa, love, energy whatever you want to call it will emanate and spread to the "assumed rival dancer" , the critic, and the audience. Dancers questioning lack of technique in contemporary and lack of heart in traditional behave like masters of different oriental martial arts, battling to prove who posses more power, more technique, more grace. these are not matters of the art, these are matters of ego. A few words by Daniele Bolelli. "There is no need for somebody to tell us whether we are moving mechanically or are truly present. When you are there, you know it. Every gesture serves as a verification of our feelings." "Specialisation is a spiritual disease- a contagious virus of the personality that is hard to escape from. It forces us to limit the range of our choices and vivisect our global vision to the point where even the most ecstatic experiences lose life and magic; its like killing a splendid animal only to place it in a museum. Only in synthesis of the most diverse fields of knowledge does life reveal its full intensity." What is important is to find your personal voice, that voice which I call naked. Bolelli mentions wars between masters of different martial artists. "The members of nearly every religion, just like the practitioners of nearly ever martial art style, argue that they are the only ones having the Way, the Method, the exclusive telephone line to God's office. Often the discourses of martial artists are soaked with a similar self-righteous intolerance. But, luckily, there are many martial artists who don't have any inclination to this kind of "Holy War" mentality, individuals who have no intentions to reduce the breadth of their visions to a fight between rival gangs and who don't wish to turn martial arts into a battlefield between "us" and "them". The love for the art they practice doesn't blind them to the beauty of other styles. Every art has a particular energy that no other style has. The different kinds of martial arts (or in our case dance. or visual arts, or story telling) are nothing but paths to reach the summit of a mountain. Stopping along the way to speculate which path is the best is a distraction leading us away from our destination. Thanks for your thought-provoking comments.Rather than a comment,it is a post in itself!I must do justice to your thoughts by responding to them-1.Im not sure it is a historically 'imposed' belief that contemporary dance is a breaking away from traditional.I think most people in India are still trying to understand what contemporary dance is.Contemporary dance is varied and has no permanent code.One direction it took WAS breaking away from the traditional, but that is not its sole characteristic.I hope that people see it as more than that. 2.Im not sure what you mean by the internal and external dichotomy and dont think its comparison with the dualities you mention are exactly appropriate.In a sense by comparing it to mind-body,yin-yang etc,you normalize it too,right?External or internal,I am questioning the foundations of this dichotomy so I didn't make this distinction.If by external,you mean dancers/spectators speaking about it(or 'normalizing' it),then I think it is precisely when the dichotomy is internal that it finds expression externally.On the other hand,if you're referring to me externalizing the debate by writing about it,I have done it because I don't believe in the dichotomy and publicly question it here. 3.Your point about finding your voice is valid and important.My discussion does not question that,but takes it as a given.The dichotomy hinders the process of finding a naked voice and demolishing this dichotomy,i think, would clear the path for this process to take place. 4.I agree that dancing with true conviction or with a sense of 'sacred love' is essential, and when that happens-it is evident.But I think a part of the process of de-mystifying dance is also coming face to face with the reality that intrinsic and sacred as it is,dance is also a matter of survival and livelihood.And it is also performance.If it werent,we wouldn't witness dancers getting hassled about tech rehearsals going wrong,and costume malfunctions.Why bother, right?Just dance with sacred love,all else will dissolve.But one does care about those other things.Also,at the risk of sounding crass,whether we like it or not,only a handful of privileged dancers around the world can afford to not care about all these things.Many a dancer with all the conviction and love in the world will still turn to other factors in order to survive.I don't think we're being true to ourselves if we say we dance ONLY for the sake of dance,ONLY for ourselves.If we did that,then why do we perform for other people?Its an oxymoron. Romanticizing the idea of dance is one thing, and yes, losing oneself to dance when everything else just evaporates and there's just you and the dance-there is nothing like it.But to say that nothing else affects or should affect dancers is another lie we tell ourselves,another romantic notion we fall prey to.We are constantly affected by several other processes in our surroundings,and why shouldn't we be?We belong to this world,and will be affected by it! I think a lot of the dichotomy is dissolved if dancers like ourselves are introspective rather than defensive about its existence within the dance world.I guess that's why I would disagree that stopping is a distraction leading away from our destination.I think instead of marching on without thought,periodically pausing is a very positive thing,specially if its for reflection and introspection.Moreover,without that,there is the danger of being self-satisfied too soon,which exterminates the need to look inward,a quality that I personally think an artist must never lose. learn so much from each other, yet choose to indulge in this frivolous divisive-politics mentality.. I don't see any love in this.. And what is the point of anything without love? Also, I personally have never understood this obsession with "preserving tradition." I have no problem with that idea, except when it starts to be forced down people's throats just because of some stupid notion that it HAS to be done. If tradition is dying, surely there's a reason? eventually obsolete practices and/or art forms in the name of tradition. Thanks for reading, Ananth! When you speak of ignoring those who could easily learn from each other but choose to indulge in a frivolous divisive politics, I think you echo my thoughts about the need to demolish this dichotomy. About love, yes – dissolving this division between classical and contemporary would certainly promote love – for the art, for each other. In a fiercely competitive atmosphere, this is not a bad thing. I see no downfalls in removing this clash. I think as far as ‘preserving tradition’ is concerned, the idea is not bad. The problem comes when we interpret the word ‘preserve’. I DO think that keeping it alive is essential, but to my mind, that does not mean attempting to museumize it. Dynamic as the nature of dance or music is, it cannot be ‘preserved’ like a jar of jam, or like a historical artifact. It must evolve. And I think its preservation, by which I mean, keeping it alive, lies in letting it evolve. I don’t think that the traditional and classical forms are obsolete. By getting into that, you might run the risk of falling prey to the dichotomy yourself, no? In fact, the whole thought about blurring the boundaries between classical and contemporary is a proof that as classical forms evolve, and innovations take place within these forms, they can never become irrelevant or obsolete. However, if we erect this dichotomy and revere it, then we keep classical for preservation and contemporary for innovation – and hence, perhaps in the minds of many – one becomes obsolete, and the other, relevant. But if they are not so dichotomous, they can both exist, and the choice between keeping traditions alive and finding contemporary directions becomes irrelevant - because with the dichotomy demolished, we can do both! Just a few comments, too lazy to put them together into a narrative. All Art is about self-expression. Of the artist. The audience just happens to be. So, just dance. Seems to me that you are looking for a "stamp of approval" from both camps. Not required. Infinity extends both ways - from the infinitesimally varied to the infinitesimally detailed. So, it is possible both to explore/invent new styles or just go deeper and deeper into an existing form/style. Your choice. Analysis of why people subscribe to a particular point of view is good for academic journals. What has it ever got to do with Art? Wouldn't the world be a poorer place if Zakir Hussain had been content with the Tabla only being used as an accompanying instrument, or him not ever jamming with other musicians? Classical forms had to be contemporary at one time. I am sure that today's "classical" are very different form the "classical" stuff of even 100 years back. Change is the only constant. Learn from everything. Reject nothing. I do not deny that art is about self-expression of the artist. But I do not agree that the audience 'just happens to be'. It may just be the way I see it, but I think audiences are essential because art is also about communicating ideas, about connecting. If the audience is so inconsequential, then artists should do away with performances, exhibitions, music concerts, film screenings and even writing. I have written about this before. If you're interested, you could see a previous blog post titled 'The Complexities of Audiences'. Would you consider that it might be quite arrogant of artists to disregard their audiences? After all, the patronage of their art comes from them too. Secondly, if you read carefully, you'll find that I am seeking a stamp of approval from no one. In fact, I am questioning both camps, not seeking their approval. I am holding members of 'both camps' liable for creating this dichotomy. This is hardly appeasement. I am hoping to provoke a dialogue. Where you say it is possible to explore and invent, and simultaneously go deeper into an existing form - I could not agree with you more. That's the whole point of this article. That it needn't be 'this or that', but rather 'this and that'. I'm quite saddened to learn that you think academics has nothing to do with art. Jean-Paul Sartre, Paul Valery, Anthony Seville and even Elliot say some absolutely wonderful things about art, without which our understanding of art might have been stunted.Here, you only create yet another division. Who are we to exclude academia from art?Academics don't exclude artists from academia. Reflecting, articulating thoughts, writing and reading about art - these are arguably 'academic' activities but essential for art.That's just my opinion.If you disagree with that, we must agree to disagree. Zakir Hussein's example - yes, of course Zakir Hussein is better for seeing the Tabla as more than an accompanying instrument and for jamming with other musicians. Just as a classical dancer is better for learning about a contemporary dance form. Exactly my point. Absolutely, classical forms were once contemporary. You consistently invoke my point about the dichotomy being irrelevant. Lastly, I agree that we must learn from everything before rejecting anything. I don't think my writing conveyed anything different. Yes, it will be. And if the artist in question is really good at his/her Art, the arrogance is earned and I am personally willing to live with it. Though I suspect the majority might not be. Till, of course the artist becomes rich, famous, or both, when it ceases to matter. 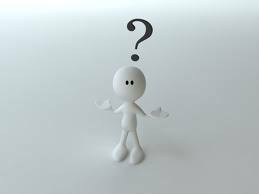 Let me put it like this - Personally, I am more interested in how a person interprets a subject - music, painting, architecture, dance, whatever rather than how good he/she performs/copies a set piece. I may not like the end result, but the person's interpretation is vastly more interesting than a copy. Reading the entry on "The Complexities of Audiences", I can only compliment you on your decision to perform for the few interested children in the audience in the face of constant heckling. "After all, the patronage of their art comes from them too." - Nope, earning a livelihood come from this type of "patronage". Absolutely nothing wrong about earning a livelihood. Each of us is part of this economic system, and we play by the rules of the time. A few centuries back, it would have been Royalty supporting the Arts, now it may be range from the Govt. of India to Corporates to Bollywood. I just think it is important for one to know what one does for a living and what one does to just be. Sometimes they match up, sometimes not. Hopefully over the long run, once one gets recognized, one has more individual freedom and opportunities to choose. Think M F Hussain doing Bollywood Billboards at one time. I was reading an article on Charles Correa(the architect). And one of the things was it contrasted the difference between him and Hafeez Contractor. The above example may not lend itself to a Pure Art form like Dance, which has no direct social(roti, kapda, makaan) value, but you get the point. Nothing wrong in either viewpoint and one is not necessarily more "correct" than the other. As for Academics and Art, I must confess I have not read any of the names mentioned. My main gripe with analysing an "artistic experience" is that these things are too subjective for my liking. Maybe I should read them before commenting further. Art as Investment - Big Business, Individual investments in paintings, etc. Art as a Force of Social Change - Increasingly limited in a corporatised, entertainment seeking world. The last has echoes in Pure Sciences and Math. For example, Pure Math, as the name states has nothing to do with reality. and they rely on patronage like university grants and super-rich corporations. Interesting. I’m glad my writing has instigated this debate. I guess we must agree to disagree on this matter though-I don’t think there’s any excuse for arrogance in an artist. Arrogance is a wall you build around yourself, after which you’re no longer open to other people’s thoughts, opinions and feelings. They all become subordinate to your own. In such a hierarchy, dialogue and discussion is difficult. Understanding also becomes difficult.I don’t understand how an artist can function like that. But that’s just me. Rich or famous – hmmm. An artist that is rich and famous, and still has humility appeals to me a whole lot more than an arrogant rich and famous artist. But again, that's just me. Absolutely, I know what you mean – the process is as important, if not more, than the end result. I'm not contesting that.But what’s the relevance of this to the current debate? I disagree with you again that patronage is the same as earning a livelihood. As you might know, most dance performances are free events. There is no direct correlation between the audience and the livelihood of the dancer. A ‘rasik’ does not provide the artist with money, the cultural organizers/sponsors do, who make up a tiny part of the audience.The larger chunk of the audience does not contribute to the dancer’s earning. By patrons, I mean – they are the ‘rasiks'.They sustain you by coming to your performances, appreciating your art,and responding to it critically. I think ‘pure’ art(what is ‘pure art’? And for that matter, what is ‘impure art’? Who decides this?) also has a direct social value. For many dancers, it is a question of roti, kapda, makaan. For many dancers, it is a constant struggle for survival. You take up a day job, you freelance, you teach – so you can pay your rent, pay your bills and sustain your dance training and practice. All the ‘art as’ that you mention are valid and important issues in their own right, and I have considered them. My point is exactly this – that when there is such a thing as art as entertainment, art as investment, art as business, art as a force of social change – it is not enough to look at only ‘Art as art’. Just as it is not enough to look at art only as business, or art only as investment. But this would call for separate blog posts of their own. For now, my point is that it is important to consider them all, not just one. As you said, learn from everything. Aranyani, you've raised very important questions and it's absolutely right that you should question the rather self-absorbed way dancers can regard each other and each other's traditions and styles. It's frustrating for rasikas too, who enjoy both the "traditional" and the "contemporary." Hi Uttara. Thanks so much for reading. :) I can only imagine how frustrating it must be for rasiks. Let's hope there are enough of us frustrated dancers and rasiks out there to stand up and make a difference!